Musicians Spencer Martin, viola and Du Huang, piano, will present a guest recital Friday, September 19 at 7:30 p.m. in Bjorling Recital Hall on the Gustavus Adolphus College campus. The recital by Martin and Huang is sponsored by the Department of Music at Gustavus and will be open to the public. Tickets are not required. For Friday’s recital, the duo will open with J. S. Bach’s “Ciaconna” from Partita in D Minor, BWV 1004 and follow with the three-movement Sonata in A minor, D. 821, “Arpeggione,” by Franz Schubert. Following a brief intermission, they will return to the stage and conclude the performance with the Sonata in E-flat Major, Op. 120, No. 2 by Johannes Brahms. Violist Spencer Martin is a member of the music faculty at Luther College. He has performed and taught at music festivals throughout the U.S., Canada, Israel, and Europe. 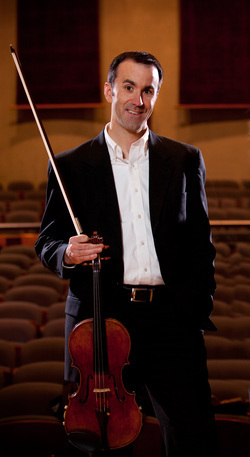 An active chamber and orchestral musician, he performs frequently in the Luther College Piano Quartet and serves as the festival violist at the Bonneville Chamber Music Festival (Utah). He has appeared as guest violist with the Pro Arte String Quartet and the Amelia Piano Trio and his solo performances include Berlioz’s Harold in Italy with the Luther College Symphony Orchestra in venues in Austria, including Vienna’s Konzerthaus. Pianist Du Huang, also a member of the Department of Music at Luther, has presented solo performances at the Grosser Saal of the Konzerthaus and the Brahms-Saal of the Musikverein in Vienna, Salle Gaveau and Salle Cortot in Paris, Shanghai Music Hall and Beijing Music Hall, and numerous concert venues in Czech Republic. His performances have been broadcasted by radio stations in the United States and abroad. Huang also performs frequently in the Unison Piano Duo with his wife, pianist Xiao Hu. They have presented piano duo recitals at Carnegie Hall Weill Recital Hall and Merkin Concert Hall in New York City, and on many concert series and University Campuses. This guest recital by violist Spencer Martin and pianist Du Huang will begin at 7:30 p.m. on Friday, September 19 at Bjorling Recital Hall on the Gustavus campus. The performance is open to the public and admission is free.